Drew Luckenbaugh is paraded by teammates. The sophomore kicker’s game-winning field goal against Nebraska was part of yet another close game for Northwestern. 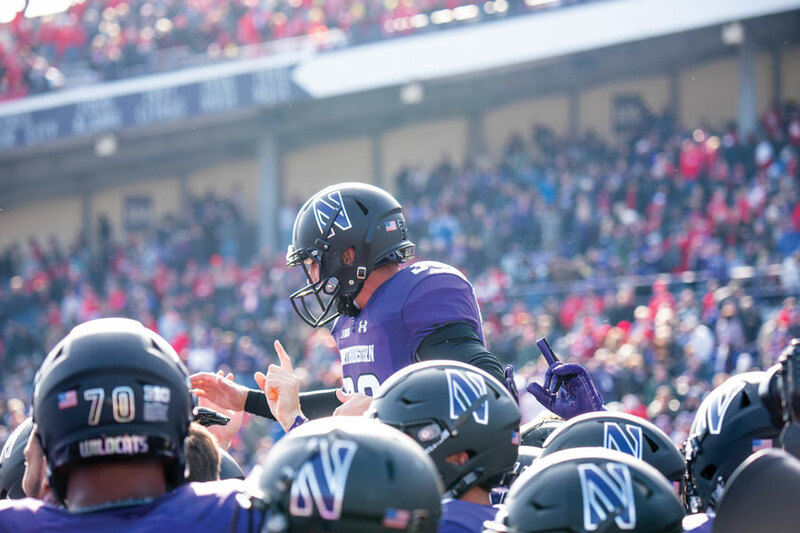 After a 31-17 win over Wisconsin that solidified Northwestern as Big Ten West frontrunners, Clayton Thorson alluded to an old nickname for the Wildcats’ program. The 14-point margin — matched only in a 21-7 loss to Duke in early September — would stick as the largest in any NU game this season. The Cats have had 10 games this season decided by 10 points or fewer, while Ohio State, their opponent in Saturday’s Big Ten Championship Game, has had just three. After NU commandeered a wild win at Notre Dame in 2014, longtime radio announcer Dave Eanet decreed that “the Cardiac Cats are back!” And they haven’t really gone anywhere since. Last season, NU became the first team in college football history to win three straight games in overtime. This season, win or lose, almost every game has been close. But within the confines of his corner office in Ryan Fieldhouse, coach Pat Fitzgerald doesn’t plan for that. And though the Cats have had a successful season that has earned them a chance to play on the first Saturday of December, the close battles haven’t been confined to a particular outcome. Against Rutgers and Nebraska, NU struggled through three quarters before finally picking it up at the last possible moment, much to the chagrin of the purple- and white-clad fans. But in close contests against Michigan and Akron, the Cats played well to start the day but faded down the stretch. In other words, there’s no science to why every game seems to be a close one: it just happens, game after game, year after year. Some players though, relish the continuous stream of close games and have a more positive outlook on the nickname than Fitzgerald. Indeed, NU has relied on its defense to execute down the stretch in close games against Michigan State, Iowa and Illinois. But the Cats have also needed offensive explosions in key moments, like a 99-plus yard drive to tie the game with seconds remaining against the Cornhuskers. Junior receiver Bennett Skowronek went so far as to say he likes the nickname. Defensive coordinator Mike Hankwitz doesn’t particularly care about the nickname.